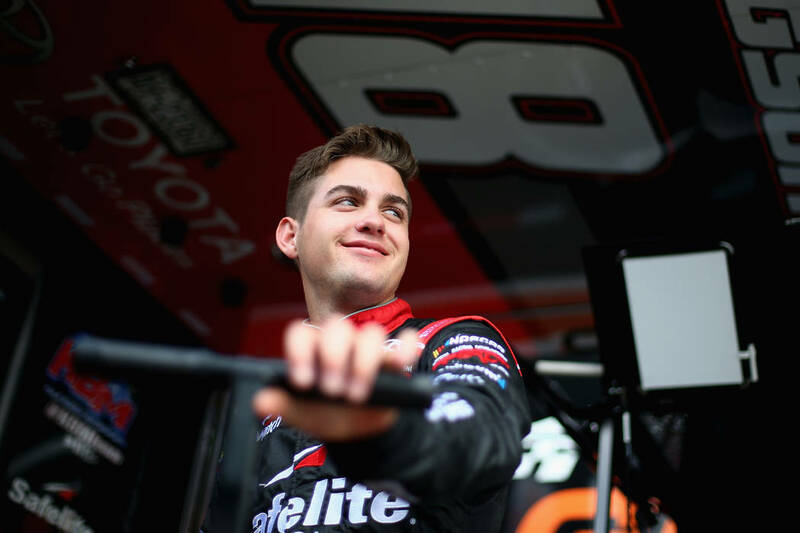 Las Vegan Noah Gragson, a contender for the NASCAR Truck Series championship who will be driving in the Xfinity Series next year for Dale Earnhardt Jr., will return home to battle some of the West Coast’s top sportsman racers. If this wasn’t an election year and Dean Heller didn’t find himself locked in a paint-trading battle for the win, he’d most likely be waving the green flag at Saturday’s Senator’s Cup Fall Classic at the Las Vegas Motor Speedway Bullring named for him. Nevada’s incumbent Republican senator, the son of former Carson City track champion”Blackjack” Heller and a former racer himself, will be campaigning in Elko according to a LVMS spokesman. So that will leave Las Vegas native son Noah Gragson to sign most of the autographs Saturday night. Gragson, a contender for the NASCAR Truck Series championship who will be driving in the Xfinity Series next year for Dale Earnhardt Jr., will return home to battle some of the West Coast’s top sportsman racers. The winner will pocket $15,000 with racing beginning at 5 p.m.
“There will be a lot of good drivers there, so it should be a great race,” said Gragson, a 14-time Bullring race winner. — In baseball it has been said all the players want from the home plate umpire is consistency. Kurt Busch said that’s not a bad idea in stock car racing, either. Busch was denied a victory during last week’s NASCAR playoff race by rules interpretations, the most grievous being NASCAR’s decision not to throw a yellow flag during overtime that would have given him the win. Instead, the green stayed out and Busch, who led a race-high 108 laps, ran out gas in Turn 4 handing the victory to Stewart-Haas Racing teammate Aric Almirola. Busch cited the Truck Series race the day before in which fellow Las Vegan Noah Gragson crashed on the last lap while racing Justin Haley for the win. The caution flag was displayed and Timothy Peters — who had bumped Gragson, starting the wreck — was declared the winner. In the Cup race, Alex Bowman crashed forcing overtime. But instead of red-flagging the race, NASCAR allowed the cars to run five caution laps, further draining Busch’s fuel supply. With NASCAR, it seems there always are 50 shades of gray. Minimum. NASCAR’s explanation for the lack of a caution on the final lap makes sense. But not when contrasted with the quick trigger officials showed Saturday. — Kyle and Kurt Busch of Las Vegas sit 46 and 30 points, respectively, above the second-tier cutoff line heading into this week’s Cup Series playoff race at Kansas after which the championship contenders will be trimmed from 12 drivers to eight. Both appear safe under NASCAR’s convoluted playoff system barring an early exit at Kansas. In the trucks, Noah Gragson is third, 11 points ahead of the cutoff, heading into the next playoff race at Martinsville, Virginia, on Oct. 27. — Tuesday was the seventh anniversary of the IndyCar pileup at Las Vegas Motor Speedway in which two-time Indy 500 winner Dan Wheldon was killed. Anyone who was there will never forget seeing those cars flying through the air in Turns 1 and 2 and the grim result. Where: Kansas City, Kansas; Kansas Speedway (oval, 1.5 miles; 400.5 miles, 267 laps). When: Friday, practice, 11:05 a.m. (NBCSN), qualifying, 4:10 p.m. (NBSCN); Saturday, practice, 7:30 a.m., (CNBC), practice, 10:05 a.m. (NBCSN); Sunday, race, 11:30 a.m., KSNV-3. Last race: Aric Almirola took first for just the second time in his career. Where: Kansas City, Kansas; Kansas Speedway (300 miles, 200 laps). When: Friday, practice, 12:05 p.m. & 2 p.m. (NBCSN); Saturday, qualifying, 8:40 a.m. (CNBC), race, 11:55 a.m., KSNV-3. Last year: Christopher Bell took home his first checkered flag in the series. Where: Austin, Texas; Circuit of the Americas (3.42 miles; 191.6 miles, 56 laps). When: Friday, practice, 10 a.m., (ESPNEWS), practice, 11 a.m.; Saturday, practice, 10 a.m. (ESPNEWS), qualifying, 1 p.m. (ESPNEWS); Sunday, race, 10:10 a.m., KTNV-13. Last year: Lewis Hamilton won from the pole, his final victory of 2017. Last race: Hamilton all but clinched the F1 championship by winning in Japan.